Here’s a sneak preview of what to expect for LIC food event @ O Cha Cha next tue! 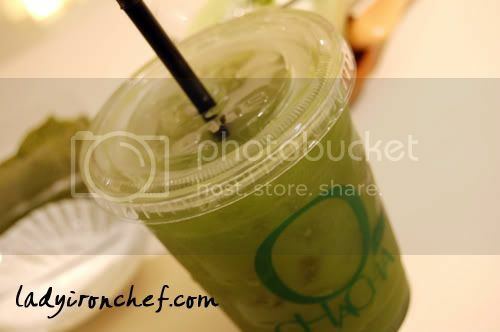 A friend and I went down to O Cha Cha last week after i got my DSLR, we went to discuss the menu with Ochacha’s boss Miss Lee Yin Siau. 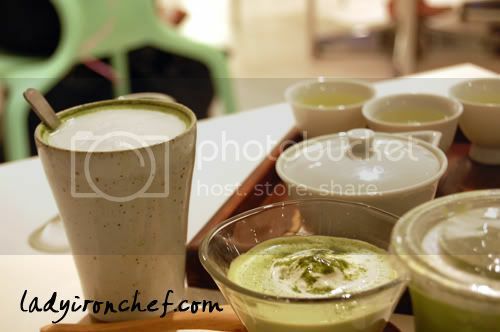 From left anticlockwise, is Mr.Ochacha Mondo, on its right is our friend Miss Matcha Panna Cotta, and followed by Ochacha Rocks, and the top is Gyokuro. Gyokuro uses the same tea leave made into Matcha, just that the whole tea leave is being use for Gyokuro which is evident inside the tea. Say hello to Ochacha Rocks! He rocks all righty! There’s also Matcha Azuki at the left background of the picture! 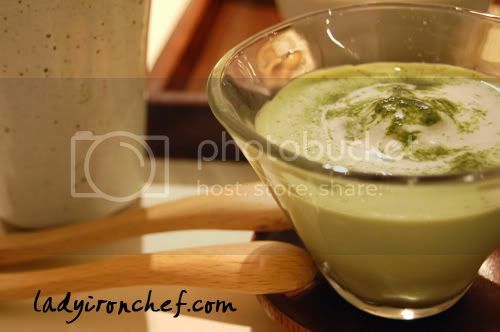 And Miss Matcha Panna Cotta! We will be seeing all of them next tue! Just in case you do not know what’s going on, LIC is proud to organise a food event outing at Ochacha, raffles city basement next tue 13th May. All the cold drinks will be served in the shooters while the hot latte in individual cups. Currently a total of 28 people have signed up for the event, the maximum capacity is 30, so RVSP now! Drop me a sms at 9623 2581 to confirm your place or should you have any enquiries. All are welcome, and feel free to bring along your friends too! See you all at Ochacha next tue! I wanna come too..!!! wait for me..!! Please let me know if I need to pay $17.50 for my missed seating. I’m very happy to do so, I fully understand how it is when people cancel on meals already ordered & prepared! hey Brad, thanks for this event. nice one! hello Brad. thanks for organising the event. It has been a real pleasure! Hello Styke and Sihan: The pleasure’s all mine! Check out the post on our dinner. Its up! Happen to see this page from Evangeline’s site.. I;m currently in Japan.. your pictures of food in Singapore really make me miss Singapore!! Hello to Si Han too! Enjoy baking yeah!